Our offices at Fulbourn are home to our Crop Protection, Seeds and Lawn and Garden business teams. 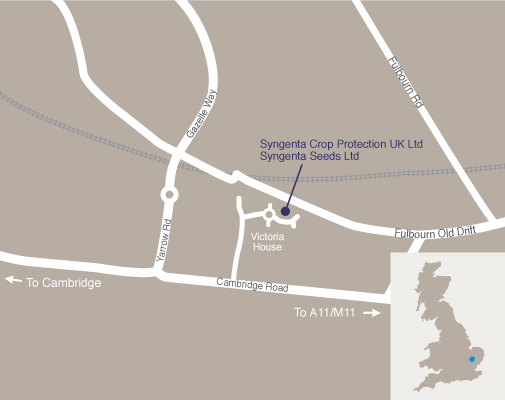 The Syngenta site at Fulbourn is the location for the commercial operations of Syngenta's Crop Protection, Seeds, Flowers and Lawn & Garden businesses in the UK and Ireland. Activities include sales, marketing, technical support, customer support, HR, finance and administration functions. The UK Crop protection business employs 106 staff at Fulbourn including home-based field force staff, and six staff in Ireland. It provides growers with a wide range of products to help protect their crops from pests, weeds and diseases. Our innovative technologies, products and services deliver efficient solutions to agricultural production problems. The UK Seeds business includes home-based field force staff and staff based at our breeding sites at Whittlesford and Market Stainton. It provides growers with a range of field and vegetable crops which meet the continuing needs for improvements in yield, agronomic traits and end user acceptance. Our plant breeding skills combine with technological expertise to address key industry challenges such as producing more food from fewer hectares. Turf and Landscape and FloriPro Services® are part of the UK Lawn and Garden business. They use their deep understanding and vast knowledge of plants and the industry to meet the different demands of commercial growers, retailers and consumers. Reception is open 0830 – 1730. Outside of these hours, your host should notify Reception 24 hours in advance of your visit who will advise CPC4 Security. If accompanied by a Fulbourn site staff member, the site is accessible between 0700 and 2100 Monday to Friday. Again, 24 hours notice is required if outside of these times. A visitor pass and site safety card will be issued on arrival at Syngenta Reception. Visitors need to report to CPC4 Security on ground floor and sign in at Syngenta Reception on the first floor. On departure, please sign out at Syngenta Reception and notify CPC4 Security of your departure. Car parking is available in car parks to the rear and right side of the building in bays marked in blue. Three designated visitor parking spaces are available at the front of the building, marked in blue. Designated disabled parking spaces are available at the front of the building. The Fulbourn offices are located on the first floor of building CPC4 at Capital Park which is approximately three miles from both the A14 and A11. Exit M11 at J9 and take the A11 signposted Newmarket, Norwich. Exit A11 onto Balsham Road signposted Fulbourn, continue straight through Fulbourn village following signs for Cambridge and the Business Park. Capital Park is on the right hand side about one mile outside Fulbourn village. Exit A14 westwards at J36 andtake A11 signposted Harlow, London. Exit A11 onto Balsham Road signposted Fulbourn and follow directions above. Exit A14 eastwards at J35. Take the third exit at the roundabout onto the A1303 signposted Cambridge. At the first roundabout take the first exit onto Airport Way, signposted Teversham and Cherry Hinton. At the next roundabout take the first exit signposted Fulbourn. Go straight over the next two roundabouts (past Tesco) and at the third roundabout take the first exit signposted Fulbourn. Capital Park is 500 yards on the left hand side. For Crop Protection Product enquiries, please email our Customer Services department. For enquiries about our other products, please view the Contact Us page. Are you looking for more information about one of our UK businesses?